Unit from Smithsonian multidisciplinary ocean curriculum. 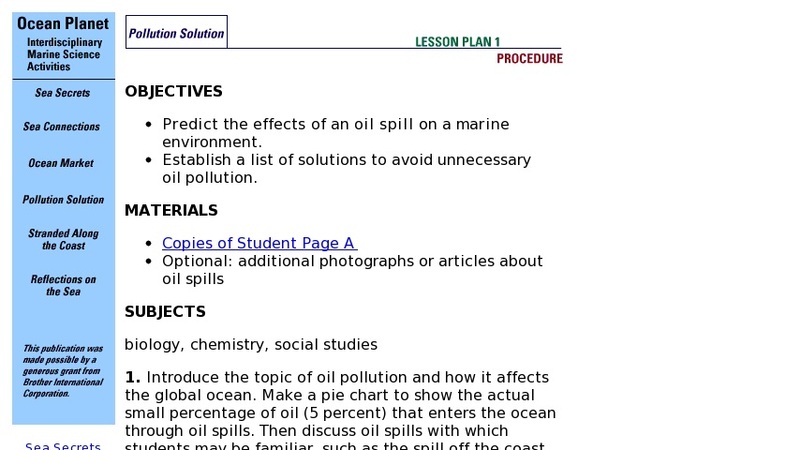 Focuses on sources of oil pollution and effects on ocean, marine life and humans. Students predict impacts of an oil spill and plan actions needed to protect and restore habitat and wildlife. Lab activities demonstrate properties of oil. Unit includes: background, instructions for the teacher, forms for student activities, discussion questions; all available online in PDF format. Resources include online version of the Ocean Planet exhibition. This resource was reviewed using the Curriki Review rubric and received an overall Curriki Review System rating of 3, as of 2018-06-04.